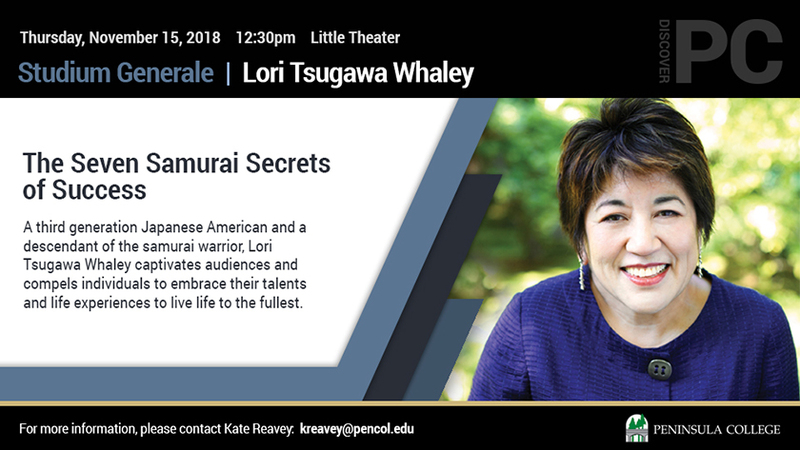 On Thursday, November 15, the Studium Generale Series welcomes Lori Tsugawa Whaley for a presentation titled "The Seven Samurai Secrets of Success,” at 12:35pm in the Little Theater on the main campus of Peninsula College. A third generation Japanese American and a descendant of the samurai warrior, Tsugawa Whaley is an author, inspirational speaker, and life coach who explains that she is “on a mission to empower others to reach their God-given potential, no matter their path, heritage, or circumstances.” She captivates and compels individuals to embrace their talents and life experiences in order to live life to the fullest. Growing up in a rural farming community, Lori struggled with being different from others. She channeled her energies in a tireless quest to learn about her Japanese heritage. The discovery of the ancient Japanese warrior code of conduct known as bushido became her guide. Today, she empowers others to live by these same principles of courage, integrity, benevolence, respect, honesty, honor, and loyalty that guided the samurai warriors. Lori’s resolve has been strongly tested, having endured the painstaking recovery from two auto accidents that resulted in Traumatic Brain Injury (TBI), and chronic physical pain. This journey to recovery is the basis for her compassion to guide others in overcoming their own limiting circumstances. She graduated with honors from Portland State University. She is a member of the Japanese American Citizen League, Japan-America Society of Washington, Japanese Cultural and Community Center of Washington, Toastmasters International, and Association of Women-Owned Businesses. A Pacific Northwest native, Lori has been married for over 40 years, has two grown children, and five grandchildren. Her book The Courage of a Samurai: Seven Sword Sharp Principles for Success became an Amazon International eBook Best Seller in October 2016. It explores the Code of Bushido, principles the ancient warriors of Japan known as samurai lived by. The book honors Japanese and Japanese- American people who exemplify this code. Lori Tsugawa Whaley shows us how applicable this code can be for our lives today. This event is free and open to the public. For more information contact Dr. Kate Reavey at kreavey@pencol.edu.